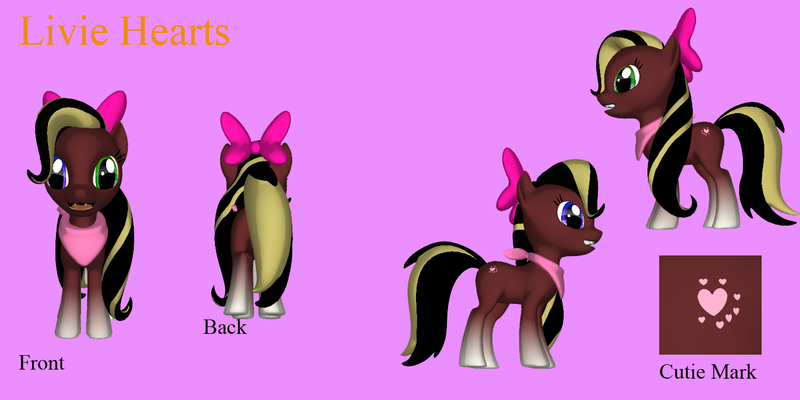 Livie is a young cheerful Pony living in the city of Manehattan. She is a student of history and has also taken interests in traditional healing methods and medicine. She has a great desire to help other ponies in all kinds of situations. Her love for others, her friendliness and benevolence is also expressed by her cutiemark a formation of eight pink hearts. Her friendly and kind nature has helped her make many friends despite being very shy. She values her family and friends as something important and would almost do anything for them. Livie was born and raised in Manehattan, where she still lives to that day. She had always been a shy little pony and had a hard time making friends in her younger years. In school she was always at the top of her class because she was a curious, intelligent and diligent student. When she finished school she decided to study history at the university, since she had always been interested in learning more about the history of all ponykind. At university she also met the girl who now is her best friend. The two of them have moved in a flat near the university together and are now roommates. While studying history she also learned about traditional medicine for the first time, a subject that she has been delving on her own ever since. Her parents and little sister also live in Manehattan, Livie has moved out however to live on her own (still loves them though). Very slim body, brown fur with a formation of 8 hearts as a cutiemark.